The Supreme Court doesn’t want to touch the Second Amendment this term. Here’s why. What happened to the Second Amendment at the U.S. Supreme Court this year? This term, the Supreme Court went out of its way to avoid the right to bear arms. June is always an exciting month for law geeks and political junkies. It’s the month when the U.S. Supreme Court typically issues opinions on some of the most controversial disputes of the day. This June will be no different, with high-profile decisions expected on abortion protests, Obamacare’s contraception mandate, and the president’s recess appointment power. Yet one of the lingering mysteries of this past Supreme Court term lies in a matter the justices seemingly refuse to rule on: What happened to the Second Amendment? The justices are rarely hesitant to wade into any hot-button legal issue, including guns. Six years ago, the court made headlines when it ruled for the first time that the Second Amendment guaranteed an individual right to own a gun. The court expanded on that decision two years later, but this term, despite numerous invitations and opportunities, the justices went out of their way to avoid the right to bear arms. Signs of this were clear on Monday, when the court in a 5–4 ruling upheld a major gun control law, the federal ban on “straw” purchasing without so much as mentioning the Second Amendment. Writing for the majority, Justice Elena Kagan reasoned that the background checks gun dealers are required to perform before selling someone a firearm would be “virtually repeal[ed]” if anyone could go in and buy a gun for someone else, while saying it was for him. In the dissent, Justice Antonin Scalia accused the majority of misreading federal law, which he said was not intended to prohibit straw purchasing at all. The justices’ failure to consider the Second Amendment was in part due to how the case was framed. The law wasn’t challenged as an infringement of the constitutional right to bear arms. The issue was one of statutory interpretation. Yet judges often look to background principles in deciding whether to read a statute broadly (as Kagan did) or narrowly (as Scalia did). One might have expected the values and concerns enshrined in the Second Amendment to at least make an appearance, if not a star turn. When the justices ignore the Second Amendment when construing a major gun control law, one suspects it isn’t merely an oversight. Even as Second Amendment battles heat up in legislatures across the country—exemplified by Georgia’s recently adopted “guns everywhere” law permitting firearms in churches, bars, and airports—the Supreme Court refused to enter the fray. 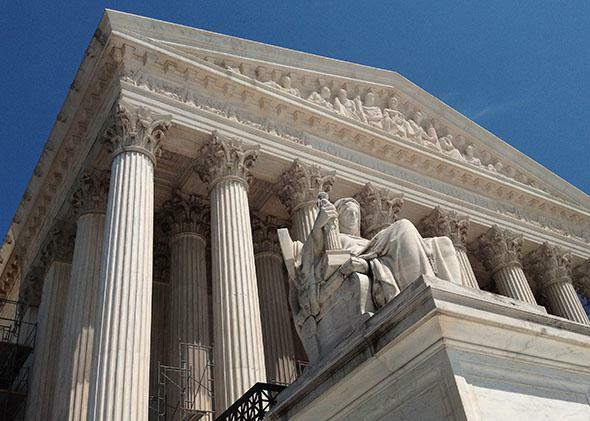 The justices declined to hear appeals in several Second Amendment cases this year. They turned away a case out of New Jersey on the constitutionality of discretionary permitting for concealed carry. They steered clear of a case challenging Texas’ ban on concealed carry by people under 21. And they denied cert in another case contesting the federal law banning gun dealers from selling handguns to people under 21. Were the justices having second thoughts about the Second Amendment? One thing is certain: There were very strong reasons for the court to take a Second Amendment case this term. The court’s previous decisions left open two major questions: Does the Second Amendment protect the right of people to carry guns in public? And what test should courts use generally to determine the constitutionality of gun restrictions? These questions have bedeviled the lower courts over the past few years, with judges all across the country offering contradictory answers. One federal appeals court held that police can exercise broad discretion over who can carry a gun in public, while another held the opposite. Some courts have adopted a test for Second Amendment cases that gives lawmakers considerable leeway to enact gun laws, while others have insisted on a more strict scrutiny. In some ways, the current Supreme Court jurisprudence on guns raised as many questions as it answered. Such disagreement in the lower courts is usually the best predictor of whether the Supreme Court takes a case. The justices understand the nation’s need for uniformity, especially when it comes to individual rights. This term, however, the justices weren’t inclined to sort out any such inconsistencies involving the Second Amendment. Indeed, when expressly invited to wade in, they balked. Über Supreme Court advocate Paul Clement, at the top of the shortlist of high-court nominees should the GOP recapture the White House in 2016, tried to goad the justices into taking a Second Amendment case. In a brief he filed on behalf of the National Rifle Association in the gun dealer case, Clement argued that the lower courts have engaged in a “pervasive pattern of stubborn resistance to this Court’s holdings” in the earlier gun cases. This language evoked the notorious “massive resistance” of Southern states to the court’s school desegregation decisions. Like the NAACP before him, he and the NRA were looking for the court to issue a clear, strong command to lower courts to read the Second Amendment broadly. No thanks, said the court, declining to take the case. Indeed, the NRA may have been this term’s biggest loser. Not only did the court refuse to hear Clement’s case and another brought by the nation’s leading gun rights group, but it also rejected the NRA’s position outright in the straw-purchaser case just decided. In March, the court held in another case that a law banning guns to people convicted of misdemeanor crimes of “domestic violence” applied to those convicted of domestic “assault,” even if it was unclear that the assault involved violent force. Although the NRA didn’t take an official position in that case, many in its leadership were surely unhappy to see another Supreme Court ruling broadly reading a gun control law to reduce access to guns. NRA disappointment might well turn into despair after Monday’s ruling, as Justice Anthony Kennedy, the court’s swing vote on the Second Amendment and so many other issues, sided with gun control advocates and the court’s liberal wing. It’s long been suspected that Kennedy signed on to the earlier Second Amendment rulings by the court only after language was inserted allowing for reasonable restrictions on guns. But the question has lingered: How far would Kennedy allow gun control to go? That question might well have been on the minds of the other justices when they voted not to hear a Second Amendment case this year. With four justices likely in favor of broad Second Amendment rights and another four likely opposed, the scope of the right to bear arms turns on Kennedy. His views may have been sufficiently unclear that neither side wanted to take a risk of a landmark decision coming out the wrong way. If, however, this term is any indication, Kennedy seems increasingly less likely to be a solid vote for expansive Second Amendment rights. Indeed, twice this term he voted for expansive readings of gun control laws instead. For the NRA, so used to winning in statehouses around the country, this can’t be good news. After this term, the NRA may be hoping that the Second Amendment stays out of the Supreme Court for a good, long while.